This is a failure to communicate to the patient and treat a post-surgical risk after back surgery case. A 65-year-old woman, a resident of Carroll County, Maryland, presents to Greater Baltimore Medical Center (GBMC) with problems in the L4 and L5 discs in her lower back. These discs often decompress during the aging process, causing pain and discomfort in the lower back, as many of us well know. An MRI performed by the GBMC doctor reveals several issues with the L4 and L5 discs. The doctor recommends an L4-5 direct lateral interbody fusion (DLIF) to stabilize the woman's spine. While the woman consents in writing to the procedure, nothing on the consent form mentions the possibility of vascular injury involved. The GMBC doctor misplaces a screw in the woman's back. The screw remains in the woman's back, in a suboptimal position, at the conclusion of the procedure. Misplaced screws in this area of the back greatly increase the risk of vascular injury and can result in life-threatening complications. The GBMC doctor makes no mention of the screw malposition in his operative report and does not discuss the misplaced screw with the woman. A CT scan is performed. But the scan fails to obtain arterial images of the area where the screw is misplaced. The GBMC doctor chooses not to conduct a follow-up CT scan, stating in his report that there is no evidence of vascular injury. When the woman returns to GBMC for her six-week follow-up visit, the doctor comments on x-rays of the woman's back that there is a slight misplacement of the screw, but overall its placement is acceptable. The doctor never mentions to the woman the potential complications that the malpositioned screw might cause, telling her to return in another six weeks to 3 months for further evaluation. The malpositioned screw ultimately leads to a small bone fracture (pseudoarthrosis), a return of the woman's pre-surgery symptoms, and requires multiple surgeries to correct. The woman filed a medical negligence lawsuit in Baltimore County, alleging that GBMC and its doctor violated the standard of care by (1) failing to inform the woman of the misplacement and discuss with her potential future complications, and (2) failing to assess the best course of future treatment by not ordering a vascular surgery consult, vascular imaging, and re-ordering a CT scan. The Plaintiff's attorneys and the expert's report do not push the idea of the misplacement of the screw as negligence in and of itself. The woman contends that as a result of Defendants' negligence she has suffered extreme back pain and discomfort, had to undergo numerous medical procedures, and has incurred medical expenses. David M. Ibrahimi: Assistant Professor of Neurosurgery at the University of Maryland School of Medicine Tragically, a year and a half after this case with filed, Dr. Ibrahimi died. It is surprising there is no independent informed consent count in this case. It may the strongest argument. Plaintiff's attorneys do seem to be, however, alleging informed consent via the negligence count. It is also surprising that the attorneys were able to recruit a Maryland neurosurgeon to testify against another Maryland neurosurgeon. Dr. Ibrahimi also has the credibility of a treating doctor because he gave her a third opinion (assuming it was not an attorney referral opinion) about what she should do moving forward after the initial surgery. It is hard to get a subsequent treating doctor to climb aboard because they are all doctors in a pretty tight community. Getting a subsequent treating doctor as an expert usually only happens because the doctor is truly upset about the care the patient received. The biggest problem in the case is damages. If she needed the screw removed anyway to avoid the risk of a vascular injury and the screw was not negligently placed, the damages may be limited. The defendants are going to argue the screw did not put the iliac vein at risk and the surgery was unnecessary. GBMC and the doctor will almost certainly contend that placing surgical screws too close to major vessels is a known risk of spinal surgery (that is covered by some umbrella language in the informed consent document). In the health care providers defense, they will argue that the risk of repositioning or removing this screw was not worth the risk. But then we come back to their causation defense. Even if there were a risk that needs to be addressed, this would have happened in any event, even if the doctor had done what Plaintiff says should have been done. 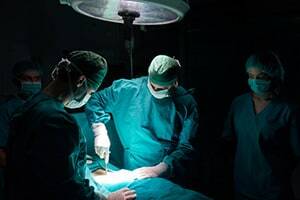 If you have been harmed or if you have lost someone you love as the result of a surgical mistake by a doctor or hospital, we can help you get justice. Call our Maryland malpractice attorneys today to talk to a lawyer about your claim at 800-553-8082. You can also get a free, no obligation online case review. What is the value of medical negligence claims in Maryland?